Background and Objective: Paranasal sinus mucoceles result from obstruction of the ostium of the affected paranasal sinus which becomes filled with secretions from the mucosal lining. We report the clinical features, management, and outcome of treatment in patients with paranasal sinus mucoceles in a tertiary health facility. Patients and Methods: Retrospective chart review of all patients with paranasal sinus mucoceles was conducted. Results: A total of 12 cases of paranasal sinus mucoceles were managed during the study period with equal gender distribution and mean age of 37.7 ± 5 years. The mean duration of symptoms before presentation was 2.5 ± 2.2 years, and all the patients presented with nonaxial proptosis, with 7 (58.3%) patients having orbital extension of the mucocele. The frontal and ethmoidal sinuses were most affected and frontoethmoidectomy was performed in 5 (41.7%) patients, while this was combined with medial orbitotomy in 5 (41.7%) patients and orbital exenteration in 2 (16.6%) patients. Conclusion: Paranasal sinus mucoceles are relatively uncommon in our region but still associated with significant ocular morbidity. Mucoceles are epithelial-lined cystic lesions usually resulting from obstruction of the ostia of the paranasal sinuses (PNS) usually from inflammatory and infective conditions, polyps, and trauma, and they contain sterile mucoid secretions which completely fill the cavity., They are chronic, slow-growing, expansive, and osteolytic lesions which can extend into the orbit and intracranial cavity. They are relatively uncommon benign lesions affecting mostly the frontal and ethmoidal sinuses, although rarely, the maxillary and sphenoid sinuses may be affected. A study of the cases of PNS mucoceles was carried out in our health facility over a decade ago; hence, this review of surgically managed and histologically confirmed cases of PNS mucoceles over a 10-year period. The aim of this study is to describe the clinical features, management, and outcome of treatment of patients seen with PNS mucoceles in a tertiary health facility. A retrospective chart review of all patients who presented with clinical features suggestive of paranasal sinus mucocele including nasal blockade, nasal discharge, facial pain, headaches, hyposmia, and anosmia, and the specimen was confirmed at histopathology after surgical intervention between July 2007 and June 2017 at a tertiary health facility, southwestern Nigeria was carried out. The information retrieved from the medical records included patients' sociodemographics, presenting complaints, and detailed ocular examination including visual acuity before and after surgery, radiological investigations carried out, treatment, and outcome of treatment in the patients. Ethical approval was obtained from the Institution's Ethical Review Board and the study was conducted according to the tenets of Declaration of Helsinki. A total of 12 patients were managed during the study period, comprising six males, (M:F; 1:1) and age range of 31 years to 45 years, (mean, 37.7 ± 5.0 years) [Table 1]. 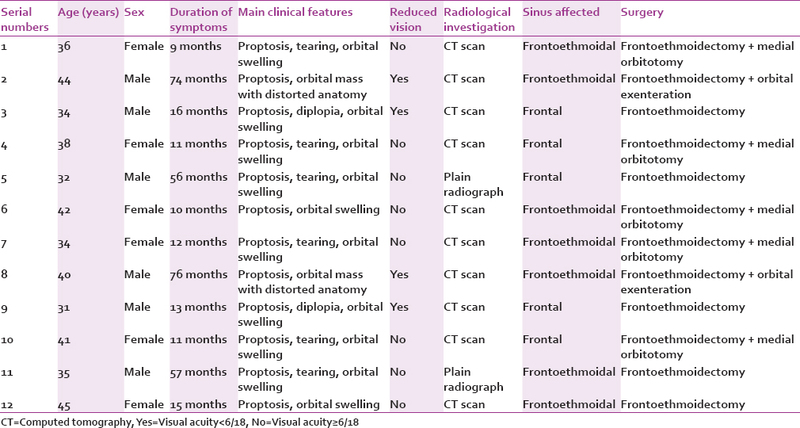 The most frequent symptomatology was proptosis, orbital swelling or mass, and tearing, with a mean duration of symptoms before presentation of 2.5 ± 2.2 years [Table 1]. Proptosis was nonaxial in all patients with inferolateral globe deviation and a mean eyeball protrusion of 8.7 ± 3.4 mm using the Hertel's exophthalmometer [Figure 1]. Visual acuity of the patients at presentation was ≥6/18 in 8 (66.7%) patients, while 4 (33.3%) patients had acuity <6/18, two of whom had “no perception of light.” The frontoethmoidal sinus was affected in 7 (58.3%) patients, while five patients (41.7%) had pure frontal sinus affectation. Five (41.7%) patients underwent external frontoethmoidectomy alone, while external frontoethmoidectomy was combined with medial orbitotomy in 5 (41.7%) patients and orbital exenteration in 2 (16.6%) patients [Table 1]. The patients were managed as in-patients between 7 days and 21 days (mean, 14 ± 4 days) with complete resolution of symptoms, and subsequently followed up in the outpatient clinic for an average period of 4.0 ± 2.0 months. Paranasal sinus mucoceles are the most common benign expansile lesions of the PNS. However, there appears to be a reduction in the number of cases managed in this series in comparison with a previous study by Ajaiyeoba et al. This could possibly be due to better management of paranasal sinusitis with resultant fewer complications or, the establishment of more otorhinolaryngology centers in the region, might have resulted in a change in the referral pattern of patients to our facility. Ogunleye et al. in their 10-year review of 90 cases of paranasal sinusitis found 6 (6.7%) cases with mucocele and attributed the small number of cases in their series to better management of paranasal sinusitis with antibiotics resulting in fewer complications. Mucoceles affect all age groups, but they are commonly reported in the third and fourth decades of life. Thus, the mean age of 37.7 years in this series agrees with previous studies.,,, Similarly, we found no difference in the gender distribution in this series as reported in some studies., Some authors,, however, reported a slightly higher female affectation, while others, reported a slightly higher male preponderance. In this series, the frontal sinus was involved in all patients either as pure frontal sinus mucocele or together with the ethmoid sinus. Similar pattern of PNS affectation has been described by previous authors., The mean duration of symptoms of 2½ years before presentation by the patients in this series is, however, higher than reported in some studies,,, and this could be attributed to the pattern of prehospital consultations among patients in the locality with delayed presentation of patients to the appropriate health facility. The most common symptomatology in the patients was proptosis, found in all patients, followed by tearing. Noted also is that four of the patients in this series had reduced vision from exposure keratopathy with two of them having “no perception of light” in the eye at presentation due to orbital extension of the mucocele, distorted orbital anatomy and possibly, optic nerve compression, for which orbital exenteration was carried out. These findings are slightly different from the report of Jaswal et al. where proptosis was found in less than one-third of the cases. The delayed presentation of our patients could possibly explain this disparity. However, two patients had plain radiographs due to financial constraints. Diagnosis of mucocele in our patients was confirmed by the histopathological examination of the specimen taken at surgery which showed pseudostratified and pseudo-columnar epithelium, goblet cells, and cellular infiltrates with neutrophils, macrophages, and monocytes. All patients underwent frontoethmoidectomy which was combined with medial orbitotomy or orbital exenteration in some patients in line with the involved PNS and associated orbital complications. They fared well postoperatively with resolution of symptoms and were discharged to the outpatient Clinic. Paranasal sinus mucoceles remain relatively uncommon presentation in our region, and delayed presentation to the appropriate health facility with significant ocular morbidity is still present in some patients. Factors that promote early presentation of patients and prompt and appropriate intervention for paranasal sinusitis will probably reduce the associated morbidity. Stiernberg CM, Bailey BJ, Calhoun KH, Quinn FB. Management of invasive frontoethmoidal sinus mucoceles. Arch Otolaryngol Head Neck Surg 1986;112:1060-3. Lund VJ, Milroy CM. Fronto-ethmoidal mucocoeles: A histopathological analysis. J Laryngol Otol 1991;105:921-3. Vicente AO, Chaves AG, Takahashi EN, Akaki F, Sampaio AG, Matsuyama C. Frontoethmoidal mucoceles: A case report and literature review. Rev Bras Otorrinolaringol 2004;70:850-4. Lund VJ. Endoscopic management of paranasal sinus mucocoeles. J Laryngol Otol 1998;112:36-40. Ajaiyeoba A, Kokong D, Onakoya A. Clinicopathologic, ophthalmic, visual profiles and management of mucoceles in blacks. J Natl Med Assoc 2006;98:63-6. Jaswal A, Jana AK, Sikder B, Jana U, Nandi TK. Paranasal sinus mucoceles: A comprehensive retroprospective study in Indian perspective. Indian J Otolaryngol Head Neck Surg 2008;60:117-22. Ogunleye AO, Nwaorgu OG, Lasisi AO. Complications of sinusitis in Ibadan. Niger West Afr J Med 2001;20:98-100. Capra GG, Carbone PN, Mullin DP. Paranasal sinus mucocele. Head Neck Pathol 2012;6:369-72. Obeso S, Llorente JL, Pablo Rodrigo J, Sánchez R, Mancebo G, Suárez C, et al. Paranasal sinuses mucoceles. Our experience in 72 patients. Acta Otorrinolaringol Esp 2009;60:332-9. Arrué P, Kany MT, Serrano E, Lacroix F, Percodani J, Yardeni E, et al. Mucoceles of the paranasal sinuses: Uncommon location. J Laryngol Otol 1998;112:840-4. Jacobson AL, Lawson W, Biller HF. Bilateral pansinus mucocele with bilateral orbital and intracranial extension. Otolaryngol Head Neck Surg 1982;90:507-9. Lee TJ, Li SP, Fu CH, Huang CC, Chang PH, Chen YW, et al. Extensive paranasal sinus mucoceles: A 15-year review of 82 cases. Am J Otolaryngol 2009;30:234-8. Sadoff RS, Rubin MM. Bilateral antral mucoceles: A report of a case. J Oral Maxillofac Surg 1991;49:193-6. Fasina O, Ubah JN. 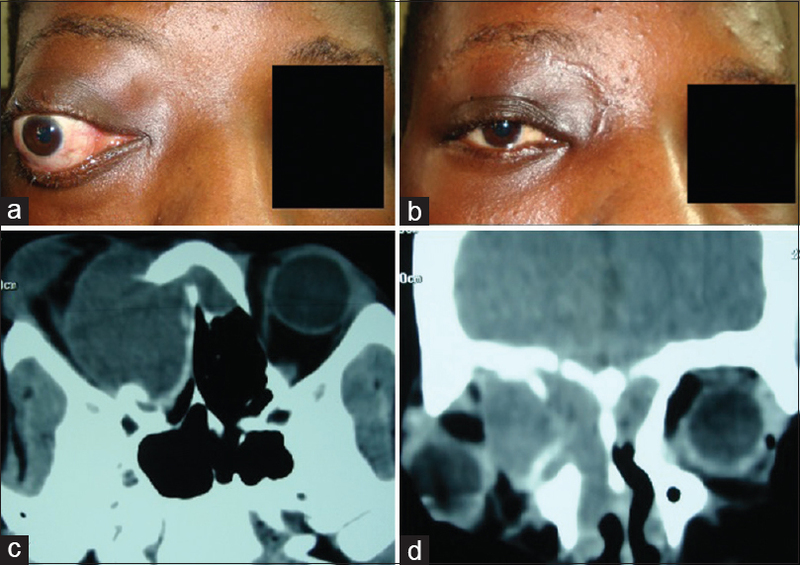 Pattern of pre-hospital consultation among ophthalmic patients seen in a tertiary hospital in South West Nigeria. Afr J Med Med Sci 2009;38:173-7. Lloyd G, Lund VJ, Savy L, Howard D. Optimum imaging for mucoceles. J Laryngol Otol 2000;114:233-6.